Budgeting shouldn’t be painful or something you do every day. Budgeting is a special event that you setup once. With this system in place, you can pay bills on time, spend money worry-free and reach your financial goals. 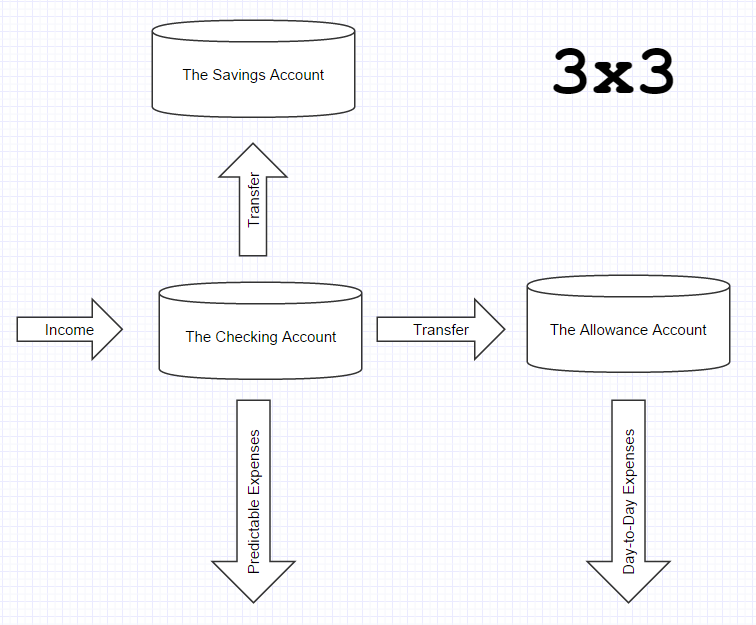 The 3×3 system consists of 3 steps, 3 accounts and 3 habits. I’ve been using the 3×3 system for 10 years now, and it’s worked wonders for me. It’s allowed me to pay off my debts, save enough money to go on multiple international vacations a year, max out my retirement accounts, invest in stocks and bonds, pay for most of my own education and save over $100K for a down payment. The 3×3 system doesn’t guarantee the same results. These are my results, and your results may vary. With that out of the way, my hope is that the 3×3 system works for you, so let’s get started! Before the 3×3 system, I racked up over $10K in credit card debt, ignored my student loans and worried constantly whether I would have enough to make rent. I’ve tried and failed at more budgets than I can remember. Track every expense religiously? Tried it, and now GnuCash is my mortal enemy. Envelope system? Tried it, and I just couldn’t keep going to the ATM to fill up those envelopes. Stop using credit cards? Yep, that helped for a while, until I started using them again. They’re just so darn convenient! I always thought it was just me. If I just had more discipline and will power, budgeting would work for me. But it’s not just me, and there’s a ton of reasons why they’re not working. What finally worked for me wasn’t budget software, gimmicky envelopes or a quick fix. What worked for me was a simple system that didn’t require much discipline or will power. Consisting of 3 steps, 3 accounts and 3 habits, the 3×3 system is designed to be super easy to set-up and even easier to stick to. This is the hardest step, but you only need to do this once. Collect a list of the things you spend money on. Look back on 1 month of transactions for your debit cards, credit cards, investment accounts, etc. Put this list into a spreadsheet, text file or simply write them down on paper. This list represents what you spend money on. For a quick sanity check, does this total exceed your monthly income? If it does, you will need to make some cuts, because you’re spending more than you’re making. We will go into some ways to make these cuts in a follow-up post. Categorize the list of expenses into 2 buckets: predictable expenses and day-to-day expenses. Predictable expenses are expenses that you get biweekly, monthly, quarterly or yearly bills for. Things like your rent, mortgage, electricity bill or Netflix that are super predictable. Day-to-day expenses range from somewhat predictable to just plain erratic. And that’s precisely where most budget systems fail for me — they ask you to predict what’s inherently unpredictable. Your predictable list and your day-to-day list of expenses form the basis of the 3×3 System. This is hard data you’ll use to drive the rest of the system. At the end of Step 1, you now know precisely how much money you spend in a month on predictable expenses. You also have a good idea of how much you spend in a month on day-to-day things. If you’re a data geek like me, you might do this for a second or third month to ensure your numbers are accurate. It’s not necessary, but you’ll get a better sense with more data. If you already have 3 accounts, you can repurpose them for this step. If you don’t have 3 accounts, you’ll need to set them up with your bank. I setup 2 checking accounts and 1 savings account. The Checking Account refers to checking account #1. The Allowance Account refers to checking account #2. The Savings Account is the savings account. Once you understand the core concepts of the 3×3 System, you can play around with variations of these accounts . In my case, 3 accounts is the simplest approach. Do you remember the day-to-day list of expenses from Step 1? Sum up the expenses for the month and divide by 2. Every 2 weeks, you transfer this total from The Checking Account to The Allowance Account. Let’s say you calculated your day-to-day expenses for a month at $1K. Then every other Monday, you would transfer $500 from The Checking Account to The Allowance Account. From now until 2 Mondays from now, you have $500 to spend on whatever you want… groceries, movies, electronics, dining out, etc. You are in complete control of how and what you spend your allowance on. You can save it for the end of the 2 weeks, spend it upfront or spread it out over the 2-week period. The list of predictable expenses? Things like utilities, rent or gym memberships are withdrawn from The Checking Account. Since you can predict these expenses, there’s not much to do here. When a bill comes, pay from The Checking Account. If your monthly expenses are below your monthly income, you’ll inevitably have some left-over money. Every month, move this money to The Savings Account. Let’s say your monthly expense total (predictable + day-to-day) is $3K. You would keep around $3,500 in The Checking Account with the $500 as a buffer. Anything beyond that amount, transfer to The Savings Account. At this point, you’ve used data to customize the 3×3 System for your life. You’ll undoubtedly go through a period of acclimation. Your 2-week allowance may not be quite right. You’ll need to make adjustments to make it higher or lower. At some point down the road, your predictable expenses will change. You may buy a home or decide you no longer want that gym membership. This, too, is normal. Since you’ve already done the hard work in Step 1, it’s a simple process to update the list of predictable and day-to-day expenses with the change. I’ve shared with you my story, and I’d love to hear yours. If you have a success story, a hurdle you’re running into or a question, post in the comment section below. You can also reach me directly via email.